It’s gloom and doom in Alberta these days, what with falling oil prices and all. Time to tighten the belts, Premier Jim Prentice says, because we’re going to be billions of dollars short in the ol’ piggy bank. Hmmm…. so how come the government is predicting a $465-million surplus for the end of the fiscal year March 31st? Yes, a surplus. Seems that this Tory government is every bit as incompetent at predicting revenue as the other Tory governments. With a surplus in the cards, it will be that much more difficult for Prentice to justify calling an election. But that hasn’t stopped Prentice from setting the table. On Friday, he told radio listeners that his budget “will be the most significant in modern times”, and it will have impacts on every single person in the province. Amazingly, he says the budget will have a 10-year plan to wean the government off its dependence on natural resource revenue, something no one has done in this province in 50 years. If Prentice could actually pull that one off, even I would vote PC. But he can’t, so I won’t. Stephen Harper, he of the delicate political touch, has decided to ram his anti-terrorism legislation through the House of Commons. He has limited debate, and clearly wants to make this bill the law of the land in time for the next election. Dozens of people who study these things have raised serious concerns about the bill, most notably how it can be turned into a tool of the government to stifle dissent. Is it a bad bill? Not all of it, to be sure, but large parts are of concern. I know this because everything Stephen Harper does is political, and designed only to secure his re-election. He knows tough-on-terrorism is a political winner, and a chance to paint the NDP and the Liberals as terrorism softies. And the fact that he is cutting off debate on a vitally important bill tells you everything you need to know about it. An outspoken opponent of Russian dictator Vladimir Putin was assassinated in Moscow on Saturday. Russia announced the Putin himself will lead the investigation. It shouldn’t be hard to round up suspects. All he has to do is look in the mirror. The Oscars were handed out Sunday. It’s always a Big Deal, but ask yourself this — can you name all eight best picture nominees? Once again gas prices took a shocking upward leap in Edmonton, another 10 cents a litre. After falling to around 68 cents, gas is now up to almost a buck a litre. What’s wrong with this picture? Everything. Leon Benoit, a dim bulb MP from Alberta, told the House of Commons this week that the Supreme Court is “lawless”, simply because it has made some judgements he doesn’t agree with. It’s always disturbing to hear Canadian lawmakers borrowing inflammatory language used by Republicans, but what’s actually funny is that this “lawless” court is stocked with Stephen Harper appointees. RIP: Star Trek nerds around the world mourned the passing of Leonard Nimoy, Mr. Spock from the original TV series, at age 83. He lived long, and prospered, thanks to his Spock role. He was somewhat conflicted, however, about the part. 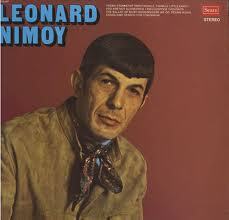 He wrote one book called “I Am Not Spock”, and a later book called “I Am Spock”. He also released an album (left) which I suspect was every bit as good as William Shatner’s album. I admit it — I’m a sucker for the Academy Awards. Just like hockey fans look forward to NHL Trade Deadline Day, I look forward to the Academy Awards. Every year since I’ve had a platform to spout opinions, I’ve made my Oscar choices. My choices are based perhaps one-quarter on my actual opinion based on what I’ve seen, and three-quarters on educated guesses. My guesswork is better, because I have no emotional attachment to a movie I’ve never seen, so my judgment is not clouded. For example, I’m STILL angry that Shakespeare in Love won best picture over Saving Private Ryan. Seriously, Academy — Shakespeare in Freakin’ Love?? This year, however, I’ve seen a lot more of the nominated (and not nominated) movies than ever before. (Speaking of not nominated, I think a few outstanding movies got shafted this year, like Margin Call, Harry Potter and the Deathly Hallows Part 2, Warrior, and my favourite movie of last year, Win Win.) I can, therefore, base my opinions on actually SEEING some of the movies, which doesn’t help. Best Supporting Actress: A tough call. There are two actresses from The Help, which I have not seen and am in no rush to. Two from one movie always has the chance of cancelling out each other’s vote. I doubt if enough people saw Albert Nobbs actress Janet McTeer to win. Berenice Bejo from The Artist has a shot, because The Artist is a huge fav with the Hollywood crowd. So does Melissa McCarthy from Bridesmaids, although I doubt the academy would want to give its most prestigious award to an actress whose most famous moment involves shitting into a sink. So, I’ll have to go with what appears to be the odds-on favourite, Octavia Spencer from The Help. Best Actress: An impressive field, and a tough call. First, scratch Rooney Mara for The Girl with the Dragon Tattoo. A surprise nominee, she is the one sure bet NOT to win in this category. Glenn Close for Albert Nobbs is a possible, but she’s been doing a lot of TV lately, which lessens her movie cred. Michelle Williams is apparently excellent in My Week with Marilyn, but she still seems to be the outsider. I think it’s down to Meryl Streep (17th nomination, just two wins) for The Iron Lady, and Viola Davis for The Help. Streep could win every year, really, which is why she has so rarely ever won. But still, my gut says Viola Davis. Best Actor: Earlier in the year, George Clooney seemed to be the clear favourite for The Descendants. But the tide seems to have turned towards Jean Dujardin from The Artist. He is wonderful in this film, oozing charm and hurt at the same time. It’s really an outstanding performance in a really charming movie. So sorry, George and Brad and all of the others… it’s the Frenchman’s moment. Best film: If I had a vote, it would to go Hugo, which was a triumph of movie making. And there’s still a chance it could win, but again, momentum seems to have switched to The Artist. (An aside: some writers have said that if The Artist wins, it will be the first silent picture to win since Wings won the first Oscar ever. But The Artist is NOT a silent film. It has a full musical score, and plenty of sound effects. It is a film without dialogue, but not silent.) The Help could squeeze in there, but from what I’ve heard, it’s still seen as a bit of a feel-good lightweight, not unlike The Blind Side from a couple of years back. Although I prefer Hugo and would be happy if it won, I’m predicting The Artist. Any film other than the three I’ve mentioned here would be a shock winner. Animated feature film: Rango, the only one that made an impression this year. Cinematography: Lots of good choices, but The Tree of Life is ALL cinematography, so it should win. Art direction: Either Hugo or The Artist. I have a feeling that The Artist is going to clean up at Hugo’s expense, so The Artist it is. Costume design: Same thing. And same result. Artist wins again. Directing: Should go to Martin Scorsese for Hugo, will go to Michael Hazanavicius for The Artist. Foreign Language Film: Canadian film, Monsieur Lazhar, will lose out to A Separation from Iran. Makeup: Albert Nobbs, for making Glenn Close look like Glen Close. Music: The Artist, because there is music in every frame of this picture. Writing (adapted screenplay): The Descendants, because it needs some Oscar love. Writing (original screenplay): A tough call. I wouldn’t think The Artist could win for a film with no dialogue, but if it does, it will sweep every award. I think it will go to Margin Call, which is a very complex story with excellent dialogue. Outside chance: Bridesmaids, to acknowledge the rise of female gross-out comedy. I admit to having watched far too many Oscar telecasts for a middle-aged man. But I like movies, and I like live, big time broadcasts where anything can happen. So, I can say with some authority that Sunday night’s Oscar broadcast was …. The seeds of Sunday’s debacle were planted when Anne Hathaway and James Franco were announced as hosts, in a desperate bid by the Academy to appeal to a younger (i.e. 14-18) demographic. I have no problem with that, but the real standard for hosting shouldn’t be age, but skill. Hathaway and Franco were an unmitigated disaster. Franco has the look (at least I hope it’s only the look) or a guy who has spend the night smoking up while watching the Academy Awards. I hope that’s not the case, but the guy looks like he’s ready to doze off at any second. Frankly, I wouldn’t let him host a wedding, much less an Academy Awards show. Anne Hathaway tried to make up for Franco’s complete lack of enthusiasm by showing WAY TOO MUCH ENTHUSIASM. She reminded me of one of those precocious high school girls who joins every club and ends up being valedictorian. And you know how much we hated those kids. Neither one of these two could ad lib a fart at a baked bean supper (and I’m guessing Hathaway has never farted in her life). And where were the stars? Where was George Clooney? Johnny Depp? Angelina Jolie? Ernest Borgnine? C’mon, guys, step up! Perhaps the strangest decision of all was to bring out Billy Crystal to introduce a few holographic clips of Bob Hope. Didn’t anyone involved in this show think that highlighting two great old hosts would only make the current hosts look even worse? A lot of people didn’t like Billy Crystal when he was host, and Bob Hope was awfully old school, but Franco and Hathaway made us pine for them… or even Whoopi Goldberg. What a fiasco. The only thing that save it for me was signing in for comedian Norm MacDonald’s hilarious and profane Twitter feed. Hey, maybe Norm should be next year’s host.